Ed. Note: This post is part of a series following the release of the 1940 Census highlighting various Commerce agencies and their hard work on behalf of the American people during the 1940s through today. In 1940, the United States was officially not involved in the burgeoning conflicts in Europe and Asia. Yet secretly the country was hurriedly preparing for war. A decade of drought and economic depression and 20 years of peace had left the military with a fleet of outdated ships, divisions of ancient armored vehicles, scores of rusty rifles, and little in the way of new weapons and other technological development. Mobilizing for war in the face of these deficits required materials and production on a monumental scale. 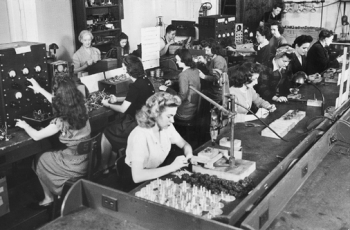 The National Institute of Standards and Technology (then called the National Bureau of Standards) was enlisted to ensure that those materials and the manufacturing processes used to shape them were of the highest quality and performed as expected.